If you’re looking for a player-friendly casino game, then look no further than blackjack. With the lowest house edge, out of all the popular casino games, it can deliver plenty of thrills and wins, and you can improve your game by remembering a few points. With a house edge that can drop as low as 0.5% to 1%, even for inexperienced players, it is possible, as with poker, to significantly influence the probability outcomes with skill – though it must be stressed that, as in all gambling, there is a large element of chance involved. Stripping things down to basics, the essential things in blackjack are knowing when to split, double down and take a hit. Split pairs of Aces and 8s. Split pairs of 2s, 3s, 6s, 7s, and 9s (unless the dealer has a 7 or higher). Double down with a total of 10 (unless the dealer has a 10 or Ace). Double down with 11 (unless the dealer has an Ace). Take a hit with 11 or less. When you have between 12 and 16, take a hit if the dealer has a 7 or higher. Don’t take hits when you have a hard hand of 17 or higher. Always take a hit with a soft hand of 17 or less. Take a hit if you have a soft 18 and the dealer has a 6 or less. Avoid splitting pairs of 10-value cards, like 10s, Jacks, Queens, and Kings. Don’t buy insurance when playing Basic Strategy. Avoid taking hits with a soft 19. You should try to split pairs of 8s or Aces, as a pair of 8s total 16, which is the worst hand. On the flip side, a pair of 10-value cards gives you a total of 20, and equates to a good hand to risk. Dealers must hit on 16 and stand on 17 under ‘dealer rules’, but players don’t have to follow this. When both player and dealer bust, the dealer will win, hence this rule only benefits the dealer. Blackjack evolved from a game known as twenty-one, which dated from the late 16th or early 17th centuries, and was originally played in areas of France and Spain. Today, blackjack is the most widely played casino banking game in the world. Blackjack inspired both Spanish 21 and pontoon. Overall chances of winning in blackjack are said to be around 42%. The chance of winning six hands in a row is 0.99%. The probability of a blackjack in a 6-deck shoe is a little lower than 5%. Absolute probability refers to anything that happens more than 50% of the time, whereas relative probability is anything than happens less than 50% of the time. For blackjack, always think in terms of absolute probability (e.g. with a hard 18 it is an absolute probability you’ll go bust if you take another hit). Always keep in mind how many cards there are in the pack, when you’re figuring out what cards can turn up. Analyse the real statistical probability of a particular card appearing – you’ll want it to be as close to 50% as possible. If you’re assuming the dealer’s hole card is 10, because it “probably” is, consider that there are 16 from 52 cards that count as 10s, meaning that the probability of it being a 10 is less than 30%. OK, so everyone has heard of card counting, but what exactly is it, and can it help? Hi-Lo Strategy: consider that high valued cards (10s, faces and aces) count as ‘-1,’ the low valued cards (2-6) count as ‘+1,’ with 7s, 8s, and 9s making ‘0.’ The aim is to get a picture of all of the cards appearing in the game, or a ‘running count.’ For example: K, A, 2, 7, J, 9, 3, 5, K. You count: -1 -1+1+0-1+0+1+1-1= -1. This makes it possible to count the real casino edge at a particular time. But, you will also count the ‘True Count’ i.e. divide the running count by the number of decks. For example, if your running count is 6, and there are 5 decks left, that’s 6/5 = 1.2. A higher true count signifies a higher advantage over the casino. But, before you get too excited, because in online software-run blackjack games online the decks are automatically shuffled after each hand, card counting doesn’t work. Even with online live dealer blackjack, in which a traditional shoe is used, card counting sounds like a useful trick, but in reality, has been proven to only increase chances of winning by a slither, and you’ve got to be seriously good to pull it off. Also, remember, that most land-based casinos these days consider card counting to be against the rules, and you may well get booted out for attempting it! Of course, as with any game where chance plays a large part, the critical rules to follow in order to get the most from your game are actually ones of self-control. Always make sure you are betting with money that you can afford to lose – only then will you be able to remain calm and level-headed. Always look at the big pictures, as everyone will have good and bad days. Don’t get disheartened when things aren’t going your way, but likewise, don’t get carried away when you’re on to something good. 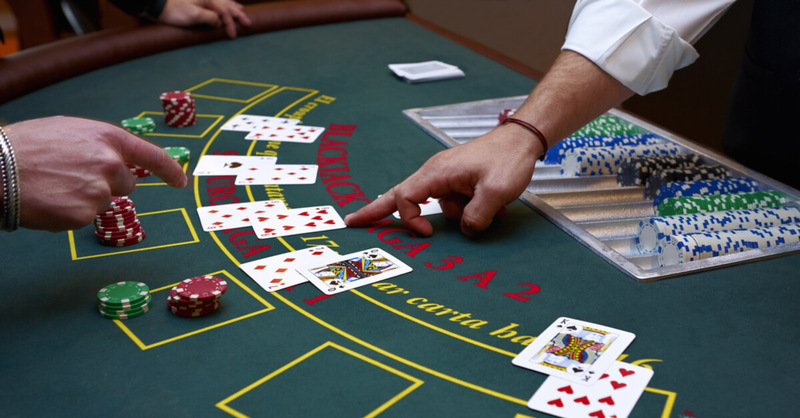 Blackjack is, at the end of the day, a game of pure mathematical probabilities. A better understanding of how those probabilities are working will enable you to take advantage of them, but can never guarantee success. First and foremost, learn the rules thoroughly, before you start playing for money. Then, as you go forward, follow your head (remember, maths is a cold, unemotional beast), not your heart. Being as though blackjack has very clear-cut rules, and statistics that can be studied, solid probabilities can be worked out. For example, if a dealer is standing on a soft 17, he will, statistically speaking, go bust approximately 29% of the time. Knowing these probabilities allows players to make educated decisions to improve their odds, unlike in games like roulette which feature blind odds. Set a bankroll and never go over that. Never, ever, ever drink whilst playing. Make sure you aren’t distracted when playing. Know when to walk away. Never chase losses. Remember that, as with any gambling, statistically you are likely to lose more times than you win. This doesn’t mean you can’t end up making a profit, but you should never bank on it. Never believe anything or anyone who claims they have a ‘guaranteed’ winning strategy. Above all, remember it is a game and you should always be playing because you enjoy the game! EnergyCasino has an impressive variety of live dealer blackjack tables from both Evolution Gaming and Extreme Live Gaming, in addition to software-run blackjack, so it’s the perfect destination for both new players and experienced professionals alike.